The first time I ever made risotto, it was a disaster. It was straight up practically inedible. So much so that I’m pretty much convinced that Mike doesn’t like risotto now because of my one and only horrifying experience. Still, I had a vision of a creamy lobster risotto with perfectly cooked slices of steak on top so I soldiered through to make this. Thing is even though the risotto was perfectly cooked this time, Mike still didn’t like it! He loved the steak, but risotto is not his thing. “I never liked risotto, really,” is what he says. That’s fair enough. I mean, I don’t like injera bread. Like, I really don’t like it. So if Mike made me injera bread, I wouldn’t dig it either. Anyway, I LOVED this risotto. It was creamy and cheesy and full of lobster and well so well with the steak. It’s like I’m straight out of the 80s and am in love with surf and turf. I don’t even think surf and turf is a thing anymore. And Mike tells me risotto is a thing of the past too so maybe I am just a really old lady? Anyway, regardless, if you’ve never made risotto before and don’t want to experience disaster, I’m here to tell you, when you make risotto, make sure your stock is simmering before you start adding it to your rice. Otherwise it’ll take you hours and hours of stirring at the stove before your rice ends up edible. 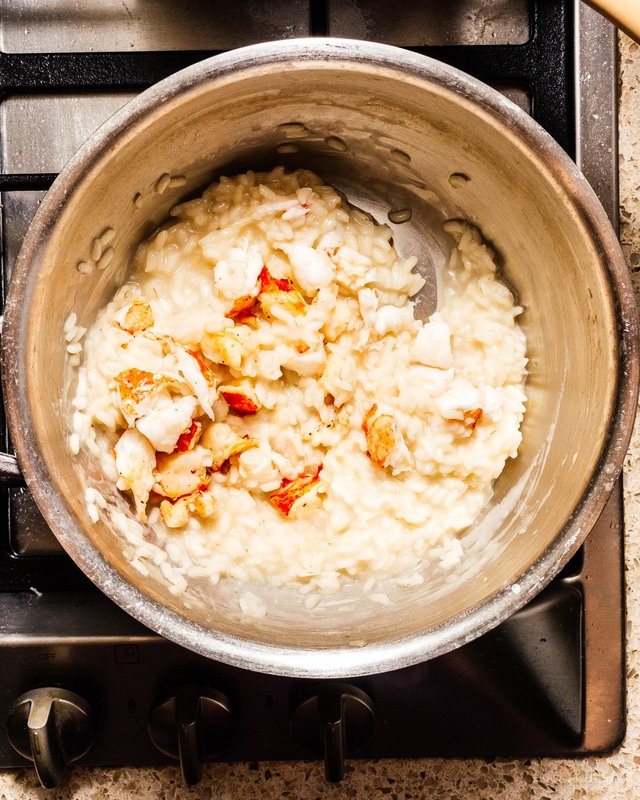 It happened to me that disastrous time – I didn’t have my stock at a simmer and I think I was at the stove FOREVER and in the end my risotto was crunchy, not creamy and just really really bad. So, pro tip: keep your stock at a simmer. Also pro tip, if you have a non-risotto lover in your life and just want to make a giant steak, make this giant steak instead. Do you guys have any cozy dinner plans this week? Let me know what you’re making! 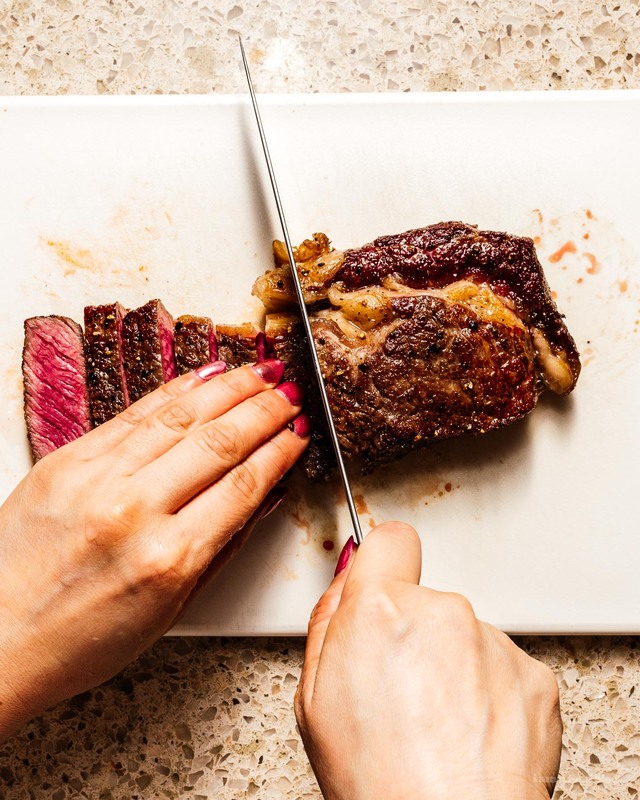 One hour before you’re planning on making dinner, let your steak come to room temperature in a cool part of your kitchen. Heat the oven to 200ºF. 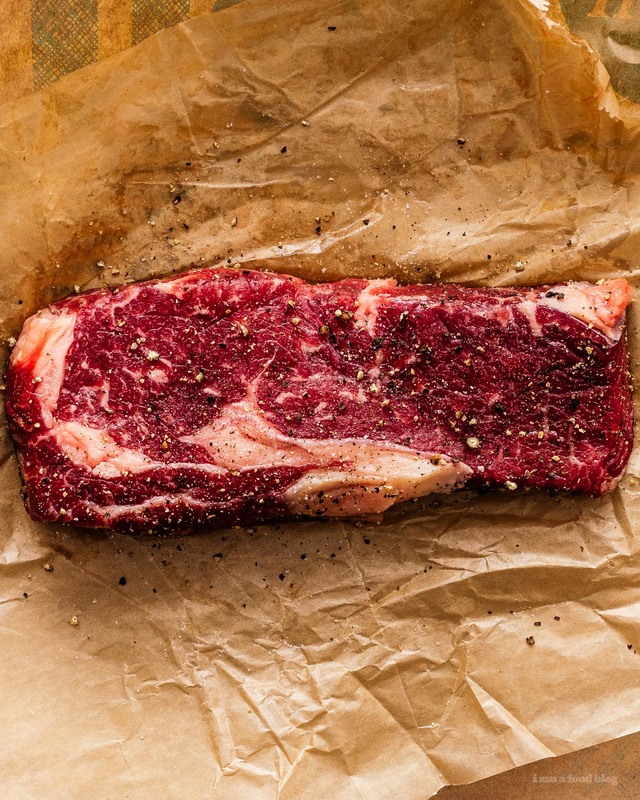 Season your steaks generously on both sides and place on a rack over a baking sheet. Cook until the internal temp reaches your desired doneness (115ºF for rare, 125ºF for medium rare, 135ºF for medium). For medium rare, it’ll be approximately 25 minutes. While the steak is in the oven, work on the risotto. 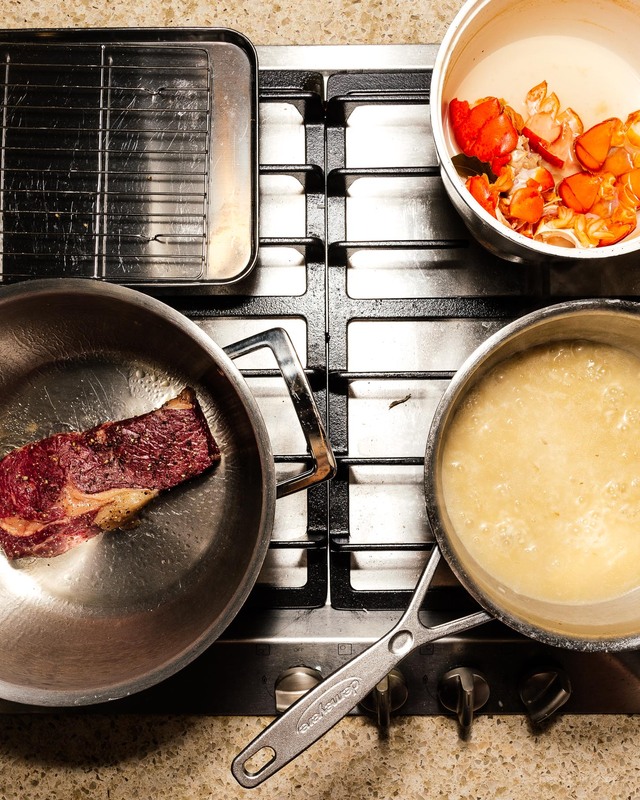 When your steak is done, let it rest while you continue to cook the risotto. 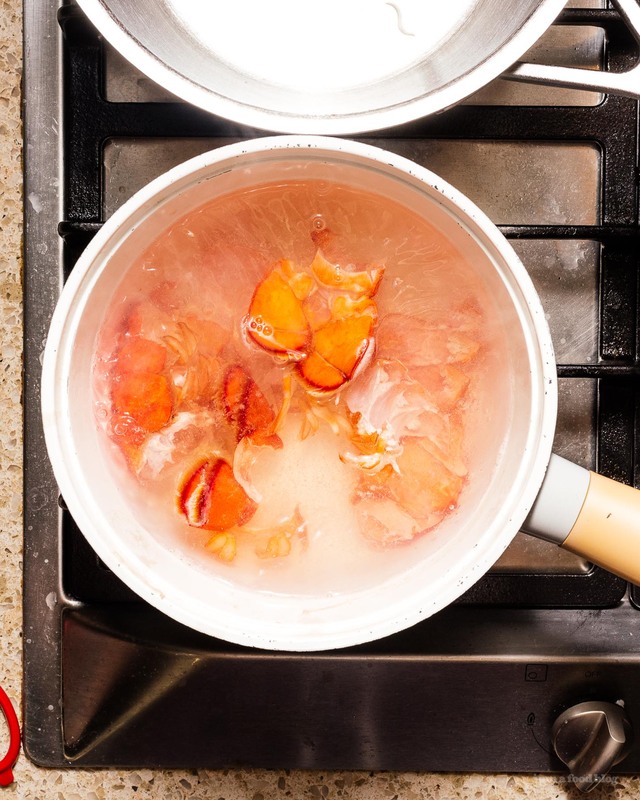 Bring a pot of salted water to boil over medium high heat. Add the lobster tails and poach until just cooked through, 6-8 minutes. When the tails are done, use tongs to transfer them to an ice bath to chill briefly. Remove the meat, saving the shells. Cut the lobster into 1/2 inch pieces and set aside. Bring 4 cups of water up to a boil. Add the shells, cloves of garlic, bay leaf, and bouillon. Taste and season with salt and pepper. Keep at a simmer. In a sauté pan, melt the butter over medium heat. Add the shallots and cook, stirring occasionally, until the shallot is soft and fragrant. Toast the rice, stirring, until the edges of the rice start to look translucent, but the center of the grains are still opaque, about 2 minutes. Add the lobster stock (avoiding the solids), one cup at a time, stirring occasionally, until the liquid has almost completely absorbed into the rice before adding more stock. You might not need all of the stock. 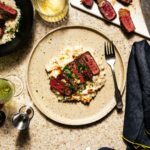 Start tasting the rice at the 15 minute mark – the risotto is done when the rice is creamy and cooked through, with a tiny bit of a bite. Finish by stirring the lobster in, along with the cheese, until the cheese is melted and the lobster is warm. Taste and season with salt and pepper. Cover and keep warm. Sear the steak: heat a cast iron skillet with a bit of oil. Sear the steaks on all sides until desired char is reached. 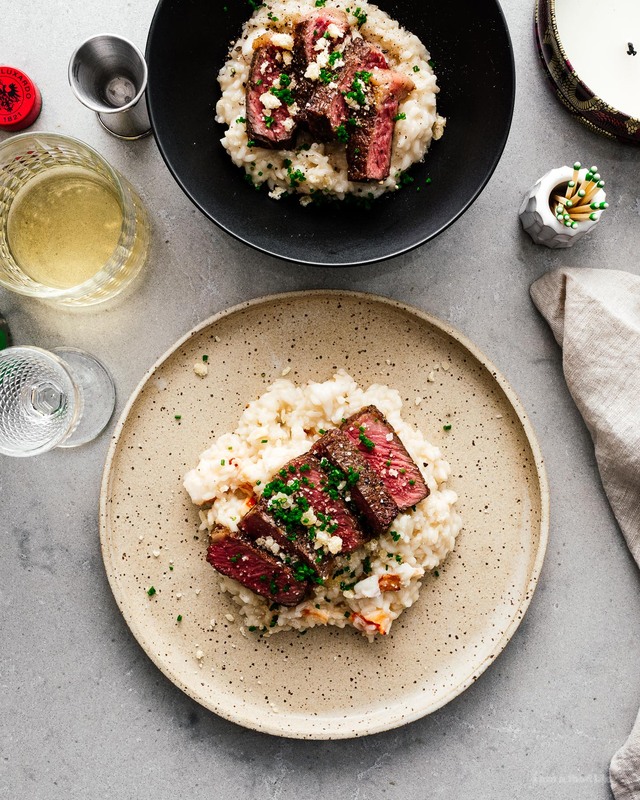 Rest steak for 3-5 minutes, then slice and serve on top of the risotto along with extra parmesan and chives.